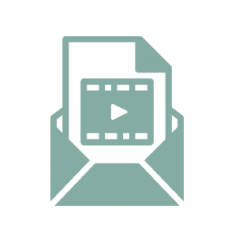 Video Uploads – Instructions Now Available. UPDATE: The video upload instructions are now available to download here! Once you’ve help your competition and selected your winner, film your winner’s recitations and submit your video. Submissions close at midnight on 31st March 2017, when the PBH judging panel start their deliberations. Watch this space for our announcements! We’ve been delighted to see lots of schools registering for this year’s Poetry By Heart competition. It’s been a healthy mix of returning schools and colleges, with new establishments giving the competition a go in the light of this year’s closed-book GCSE exams coming into effect. Our downloadable handbook for the Poetry By Heart main competition is available to all interested – if you haven’t registered yet, please do so here. Plus, with the introduction of our Shakespeare Sonnet competition (On It Like A Sonnet! ), we’ve had some great feedback from a broad range of participants who have shared their experiences of exploring our showcase and memorising the sonnets. Having said that, if you haven’t already given the Poetry By Heart 2017 competition or our Shakespeare Sonnet competition a go, why not register today and start preparing for 2018? Our new Learning Zone is brimming with materials for organisers and participants to explore and make use of, and of course if you’d like a much more one-to-one approach to your questions, you can get in touch with our office any time. The Poetry By Heart team recently went to the British Library to meet up and explore the set-up for the weekend. We’re pleased to report the location is spectacular and we really think all those who attend will have a wonderful time. We’re in the process of finalising the programmes and setting up invitations, and it will be important for all those who are invited to be swift in responding to ensure they have a place at the event. 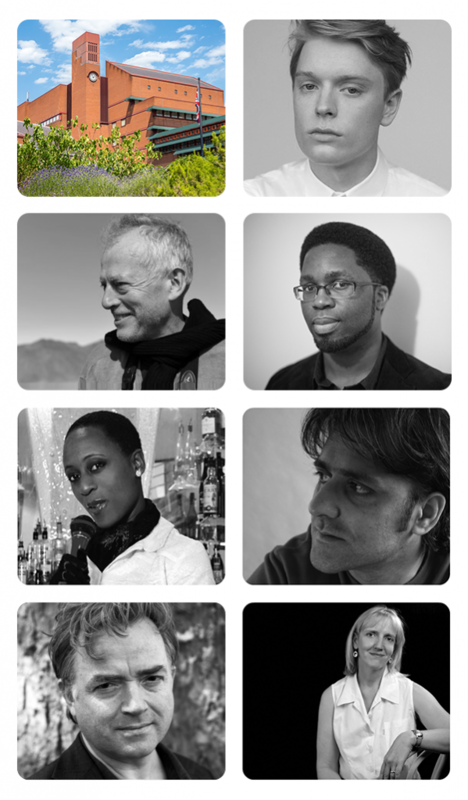 Since confirming our venue, this year’s Poetry By Heart judges had previously confirmed: Daljit Nagra, Patience Agbabi, Tim Dee, Glyn Maxwell, Jean Sprackland will be judging the performances. But this just in: Jacob Sam-La Rose has also confirmed he will be attending the Winner’s Weekend this year! And thrilled to announce a surprise confirmation from the lovely Freddie Fox – recently featured in Poetry Hour – will also be attending the Winner’s Weekend! Previous PBH finalists Grace and Caelan got together to perform a fab piece of poetry by way of our interval entertainment! We had a wonderful competition – they were all winners really! Don’t forget to email us your competition date and winner’s name! A Free Book Each Friday! 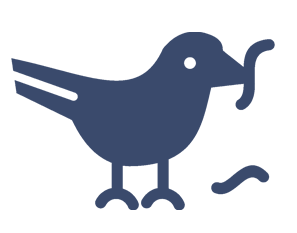 Have you been following us on Twitter? 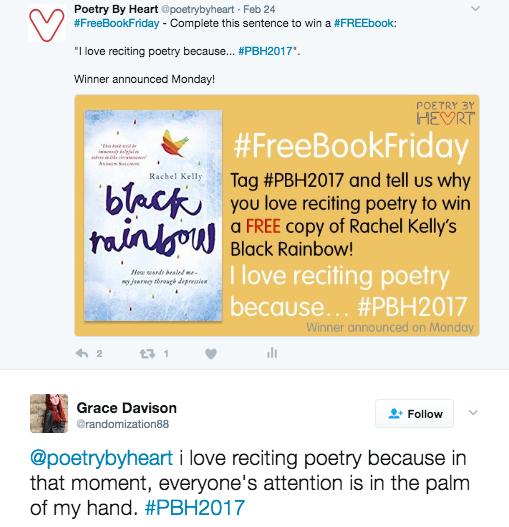 Each Friday we’re asking people to tell us why they love to recite poetry for a chance to win a free copy of a book that we think you’d love! We’ve announced winners on Mondays – why not have a go this week? Alison Powell explains the similarities between cake eating and sonnet memorization to students. 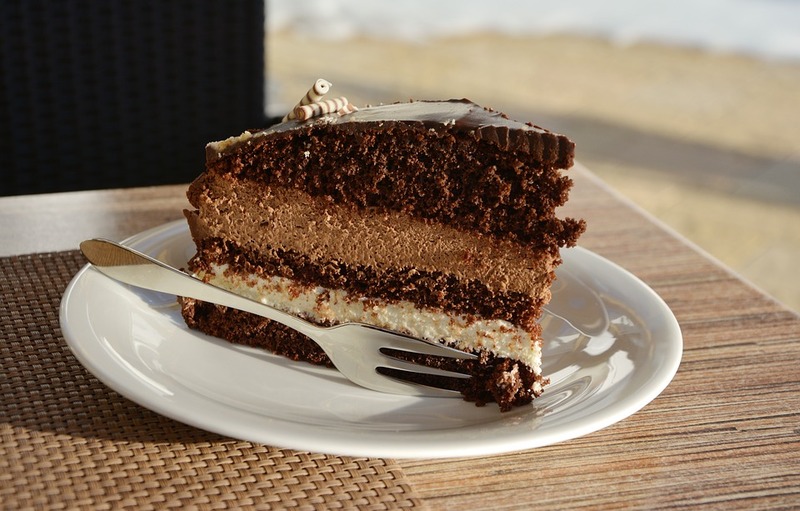 Cake: Looks chocolate-y and good, but you can’t know how delicious it really is without taking a bite. That’s great. But although reading a play in the classroom does give you a bit more of a flavour, it can be more like looking at a recipe and saying you’ve eaten the cake. 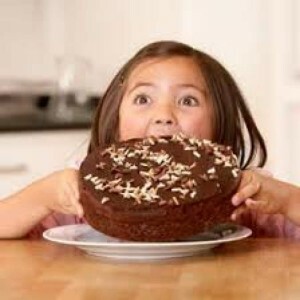 Again, you’re getting an idea of the cake, but you’re not getting the full experience of tasting it. You can think of a play as a recipe for actors. Until it’s brought to life on stage, it’s a bit flavourless and two-dimensional. You’ve come closer to understanding Shakespeare, but still haven’t had a proper bite. There is, of course, only way to truly know how lovely the cake actually is. I can talk to you about it for hours. I can describe the fluffy light sponge that melts on your tongue and the gorgeously not-too-sweet cream that oozes from its centre. Until you’ve had a proper mouthful of it, though, you’re never going to appreciate the full-taste experience. So how do you eat the works of Shakespeare? The most effective way, I’d argue, is to perform a play or a poem by learning the words by heart. Shakespeare’s sonnets are just fourteen lines in length, so they’re a great place to start. To learn a sonnet, you’ll have to spend some time with it, pinning it up on the walls of your interior world so that when you speak it aloud you have the chance to taste the words without looking at them on paper. In the process of memorizing the lines you’ll come to understand how they roll together, to know the rhythm and the underlying metre. You’ll get to know the words and start to notice their layers of meaning. You’ll begin to feel the way the poem turns around line eight and appreciate the satisfaction of the final rhyming couplet. The words might even start to feel like they’re your own. This is a totally different experience to reading the words on the page. And, like eating cake, it’s not something anyone else can do for you. You have to try it yourself. Without having a good mouthful of the actual cake, you’ll never know about the secret ingredients the chef has added to surprise you. Without learning a sonnet by heart and speaking it aloud, you’ll never get to know its truth. So come and find out what the fuss is all about. Take a big bite of Shakespeare. The NEW Learning Zone is Live! We are so excited to tell you all about our brand new Learning Zone, designed for teachers, students and curious visitors alike. 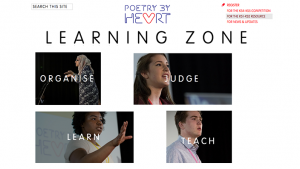 Each section of the Learning Zone is packed with useful materials – ranging from video performances to helpful guides on how to memorise a poem, and sign posting to blog posts that might be of interest and more. We’ll be adding more materials to it over time, so check in regularly to see what’s new, plus we’re always looking for feedback on what you think about the Learning Zone and what you’d like to see in there. So feel free to drop us a line via info@poetrybyheart.org.uk – we’d love to hear what you think! Tell Us Your Competition Date and Download Julie Blake’s Reflections on Memorising and Reciting Poetry! While we were putting together our Learning Zone, we came across some GREAT materials that we thought teachers would LOVE to get their hands on. In return for your competition date, we’re giving away this Julie Blake articl, which reflects on how memorising and reciting poems can transform the way we engage with, feel about, and understand poetry. All you have to do is enter in the date of your Poetry By Heart competition, or your easy-peasy Shakespeare Sonnets competition, and you can download the link straight after! Your Pack Is On Its Way! If you’re a registered school waiting for your poster pack, you’ll be pleased to know it’s on its way on their way! The packs include gorgeous posters about the competition for you to put up and a free copy of Forward Arts 100 Prized Poems, and more! There’s Still Time To Hold A Competition – Why Not Have a Go? You still have until the 31st of March to hold your very own Poetry By Heart competition with just three students, reciting two poems each. In just one lunch time, you could hold your competition and pick a winner. Or why not try the Shakespeare Sonnet competition with just one student or member of staff by memorising and reciting a sonnet from our Shakespeare Sonnets showcase? You can download a cheatsheet by filling in this form. With the return of closed-book questions returning to GCSE exams this year, poetry recitation is a valuable skill and the Shakespeare Sonnets competition, as well as our annual Poetry By Heart competition, are great opportunities for students to focus on practising their memory and recitation skills. If you’ve already held your competition over a lunch time, lesson or assembly, then be sure to let us know who the winner is, plus, now is a good time to refer to Step 10 of the handbook for guidelines for videoing your winners’. We’re doing final tests on the video upload tool and the instructions for it. We will be ready for you to start uploading your videos soon – watch this space for more updates! In the meantime, why not check out our NEW Performance Gallery, featuring performances from previous years’ contestants? Tell Us Your Poetry By Heart Stories! 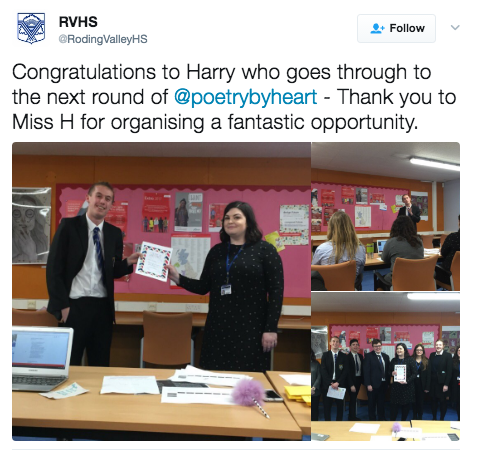 Why not ask your competition winner(s) or any of the students who took part in Poetry By Heart to write to us telling us about competing in Poetry By Heart or about the experience of choosing, learning and reciting a poem. Every year we are absolutely blown away by the stories teachers and students alike tell us about their experiences with Poetry By Heart. Why not get your students to share theirs? We’ve a pile of special poetry prizes for the best stories – so we look forward to reading your story soon! Our team of competition advisors are here to help – simply drop us an email via info@poetrybyheart.org.uk and we will give you a call whenever is best for you to take you through your questions and also help you set up your competition!